This lampshade depicts a lovely view of the popular Staffordshire walking destination of Cannock Chase. 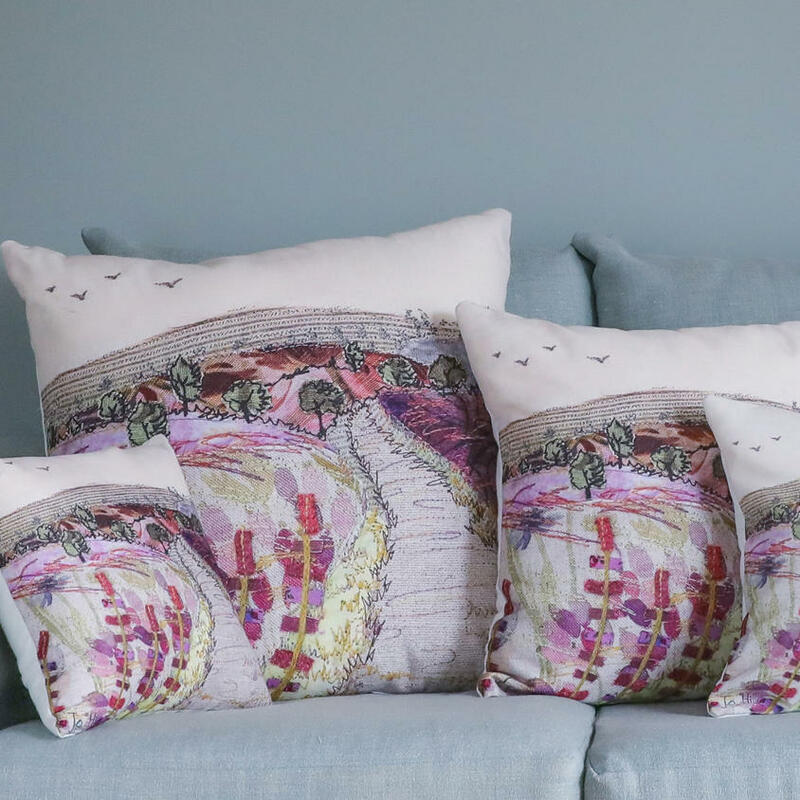 It is a high-quality print on fabric of my original Cannock Chase textile piece in stunning pinks, purples and greens. I created the original handmade piece using my unique style of free-motion embroidery, which took several days to complete. I recreated the gorgeous countryside colours of the heather and grasses in appliqué and stitch. You can see the original textile piece on these photos; these lampshades are an excellent reproduction of the original embroidery! This is a beautiful way to bring a little bit of nature into your home and the lampshades produce a lovely glow when illuminated. All lampshades are suitable for either ceiling and table/floor lamps. Please indicate whether you'd prefer a ceiling or lampbase fitting from the drop-down menu below. Conforms to BS EN 60598-1-2008, the British Standard for Luminaries. All of the lampshades I sell are fire resistant. The PVC material has been tested in the Lighting Association Laboratories and has passed the glow wire test. The lovely lampbases in the photographs were made for me by the wonderful Natajaq, a family-run woodturning company based in Bath. Natajaq have agreed to make their beautiful lampbases available to my customers. They are available to buy when you purchase any lampshade. The 'Doric' - Dimensions: (approximate): 25 cm height. Base diameter approximately 8-9 cm - £70. Ideal for Small lampshades. The 'Doric High' - Dimensions: (approximate): 31 cm. Base diameter approximately 9-10 cm - £75. Ideal for Medium lampshades. Please allow 2-3 working days for UK delivery. Delivery charges start from £5 for one lampshade, and we offer free UK postage over £50. Please note that I am happy to ship worldwide but due to the size and the fragile nature of the lampshades, it's better that all medium and large lampshades be sent on a tracked service. Please select the tracked shipping option at checkout. Alternatively for cheaper international shipping you could have it flat-packed. You will receive the fabric attached to the PVC, with the rings and sticky tape separately. Full instructions with photographs will be provided for you to make up the lampshade. For UK delivery you will receive the lampshade made up in full.